I am lucky really. This may sound odd but it's true. My name is Ben from South East England in the UK! 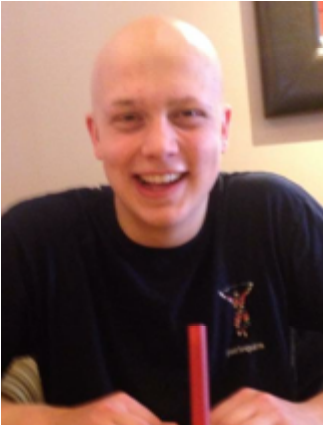 I'm 18 and have been bald for six months due to alopecia. Usually you wouldn't associate that with being lucky but I am looking past that. My story starts when I was 14, I had my first bald patch at the back of my head - about the size of Apple at its largest... I was fine with it, it didn't really bother me as it was small and I assumed it was temporary. Soon enough, maybe after six months it disappeared. Around a year and a half later, the same patch came back; I wasn't alarmed, just a little irritated. I assumed it would disappear soon enough. The patch got bigger and remained for a year; fortunately it was in the right place so I could grow the hair above long enough to hide it. I wasn't ashamed of it, I showed people because I thought it was a bit different and ‘no biggy'. When I was 17, it began to annoy me more and more. I wasn't embarrassed but it was very frustrating to think it wasn't getting better! I couldn't have the haircut I wanted (not really a huge issue in perspective but at the time, horrible). As my AS level exams approached, my condition was developing... Two small spots appeared either side of the crown of my head; both about the size of a grape; again not a huge deal but I was more self conscious about these ones. My hair was long enough to hide them but the effort to cover them grew also. In April 2014, my two little spots began to grow as well as my big one at the back.... I was managing to cover them still. My exams passed and in June I was still able to hide them with much struggle and despair. I was really getting to the end of my tether with it all - I kept snapping at family members who just wanted to help, which now I feel extremely guilty for. During this time I saw many doctors, specialists and sought homeopathic practices to help determine the cause / perhaps find a cure for my problem. A trichologist offered me hair spray with a dark brown 'paint' element which helped conceal my bald patches further... I was much more relaxed about it when I found this "solution". Many people still didn't realise how bad my situation was because, with great help from my mother, I managed to keep them hidden. Besides this, I tried many steroid creams and circulation boosting ointments to attempt to stimulate hair growth but nothing seemed to work. A key event within all this was meeting my first girlfriend in June last year... I was very happy to be with her but I was constantly concerned about her finding out. Furthermore, the dye in my hairspray used to come off on fabric, so I was forever worried about staining her furniture. I one day decided to be open with her and talk about it, she said she noticed (how could she not) and was supportive about it. Again this made more relaxed about it and still I was optimistic that re-growth could occur. Between July and September 2014, my hair loss was at its fastest acceleration. My two patches on the top of my head became three and the large bottom one grew further... I was panicking; “they'll all get bigger and form one big one, I know it” I said. This was my biggest fear… but I didn't think it would happen so quickly. It got to the point in late July when my three top patches merged - I couldn't cover the mass patch without looking sillier than I already did. I looked like a monk... hair around a large bald circle at the crown of my head. I hated it, I wore a hat most of the time. Between September and October, my large 'monk' circle grew larger and I rarely had it exposed apart from being at home. I wore a wooly hat most of the time and just exposed my fringe to create the impression I had 'normal' hair. I remember going to my first concert wearing a thick wooly hat in fear of ridicule; I was so hot, it was dreadful but my embarrassment kept it on. In early October, I thought “you know what, no one cares! !”- I made the decision to not wear a hat all the time. It was a big one for me as I stood out quite a lot, it was very odd looking but luckily my school community was very supportive and I received literally zero ridicule for it. In the same month, I noticed at the front of my hair line, two small bald patches were starting to form... At this point I was still in denial that full baldness was coming, I still believed it was going to grow back. My hair was then coming out every time I brushed my hand through it, every time I had a shower I could see it on the floor... I now had a total of four bald patches. The two large ones then connected and then I developed one above each ear. I knew it was coming. Early November hit and I had about 50% of my hair, on the 10th of November I went to have a haircut; I went to a proper hair salon (I started using them as they were good at doing haircuts that helped hide my patches) and I told my hairdresser to do her usual. She showed me what it looked like after she finished, my heart sank... I thought I looked horrible! 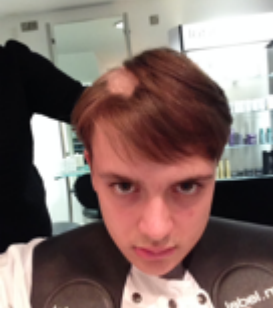 The bald patches were clearly visible at all angles. “Is that okay for you?” she asked… I had tears in my eyes… I knew it was time to let it go. I told her to shave it off, “I think it will look better”. I watched her in the mirror perhaps shave off the remaining 40%/50% of hair. My mum was by my side helping me through and trying not to get upset herself. This decision was key for me, I wanted to beat alopecia, not let it beat me. I was in control, I was the one who made the decision to go bald first. Screw alopecia, it didn’t own me… I owned it. 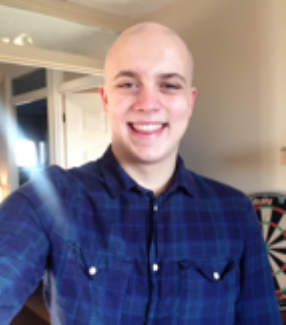 Getting it shaved off was a difficult decision but one I am pleased I made; it was difficult and the hardest part was coming home to my unsuspecting father and brother… I felt so nervous about their reaction. Needless to say, it was met with support and emotion. Additionally, I was concerned about my girlfriend’s reaction; “Will she still like me?” was the biggest question running through my mind. She reacted in a way to be expected - shock. But she was extremely supportive and stood by me which I hold deep admiration for. 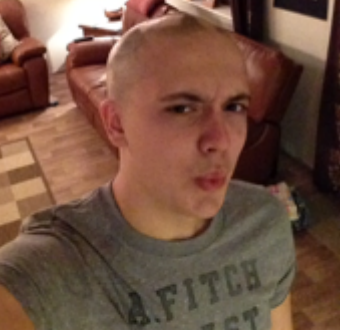 The day after I shaved my head was interesting… I haven’t mentioned this previously but I was the Head Boy for my school and therefore had to make many speeches and attend ceremonies in my last year of school. The day after I shaved my head, I had to lay wreaths in front of the entire school at our WW2 memorials. This was, accidentally, my ‘big reveal’… I didn’t even think about it the day before BUT in a way it was extremely liberating to reveal my ‘new look’ to my entire school community at once. In my opinion, looking back, this was the best way to do it. Since then, my hair has continued to fall out, I shaved it regularly to keep my existing hair short but in Feb 2015, I didn’t need to anymore… I've lost 100% of my scalp hair now. Alongside this in the last six months I have lost much of my other body hair and various patches are missing around my body. Finally, in the last two months, what has concerned me the most is the gradual disappearance of my eyebrow hair… Both of them are at least half as thick as they were - which is extremely bothering for me as it is the next level of the condition really. Thinning eyebrows - the worry of many with alopecia! In the last 2 weeks I have become psychologically, much better. I have decided that it shouldn't bother me, that I should embrace it and strive to help others. This condition is a part of what makes me, me. I am lucky because I still have a loving family, I still have a roof over my head and food at an arms reach. I still have good health in other aspects (at least my condition isn't life threatening). I still have friends and most importantly, I am still me. Alopecia doesn’t define you, you define alopecia. 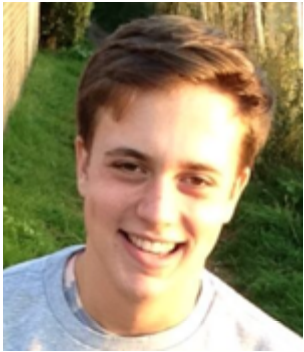 Thank you to Ben for sharing his story and watch out for other posts from him in the near future! If you enjoyed reading that, then why not check out this post about shaving. Don't forget, if you want to become a PrettyBald blogger, we'd love to have you on board. Alternatively, you can send us your story to share with our followers, to help provide support and generate awareness too! If you've been keeping up with the blog recently, you may have spotted my outrage at a hairloss advert that promised six times faster hair growth than normal. You may also have spotted Trichologist Mark Blake's comment labelling claims like these 'Pure Fantasy'. So, how can you protect yourself against common scams that seem oh so convincing, yet can leave you disheartened, out of pocket and potentially even in ill health? Don't get drawn in... first and foremost, don't get drawn in by the words they use. Any advert hoping to gain money on at best vague promises will use tempting words that hope to draw you in. Take a step back and look at what they are actually promising, not what they are writing - is it faster hair growth or stimulation, healthier locks or damage repair. A lot (but not all) supplements will have some basis in truth and may well help in some cases, but they aren't miracle workers, so the promises have to at least be realistic, and you have to be sure it is what you want and need. Is it realistic...? Whilst hairloss still has some medical mysteries, there are some agreed facts and triggers, even if it isn't fully understood. There are also a set number of treatments which are medically approved and clinically recommended and only these will have some likelihood of helping significantly reduce or reverse hairloss. Anything else is likely at best to have minor benefits, if they can help at all. If in doubt, you can also ask a Doctor or Clinician about the claims, but it should be fairly obvious if they are overselling the product. Has it been in the News? A cure for hairloss would be worth billions on the market, whether as an over-the-counter product or a prescription only medicine, a pharmaceutical company would LOVE to bring it to market. If it hasn't been in the news (on a credible website) at some point, then it is likely that any big claims will be grossly overstated. Look for the obvious... Is it spelled correctly? Does it make sense? Don't get me wrong, spelling isn't everyone's forte and we won't all be perfect (I myself have spotted a few typos on this blog), but things should be spelled correctly most of the way through. Obvious errors can give an indication that the company is less than professional. You should also take the product name and Google it - it should pop up multiple times and have the same sort of promises, written in lots of different ways. Are there reviews? Reviews can be hugely beneficial to determine whether a product may work, but they are also opinion based. First, make sure the review is from someone you trust - a friend, a blog you follow and have tried something from before, someone else in the same position as you etc. It should be independent though and not on the first blog / article / resource that you come across, because they can of course be faked too! It's also worth noting that unless a photo is time-stamped from the camera, time between photos can be adjusted to suggest better or faster results than actually exist. Is it clinically tested? This is probably the single most important one... Is a product clinically and independently tested? Whilst a plant extract that *may* promote glossy hair won't need to be clinically tested, it equally won't have significant benefits either. If a product promises full regrowth or six times faster growth, then it will need clinical testing and it will have scientifically proven results and probably a write-up in a medical journal too. This is the case with the JAKs inhibitors which had much media attention at the end of last year, and which have yet to be fully researched let alone released on the market. At the end of the day, if it sounds too good to be true, it probably is, and if it promises instant regrowth, it probably won't! Much as you would like the promises to be true, just remember, if you buy in and it doesn't deliver, you'll be left feeling totally disappointed. Once again, immediately the hairloss was linked to stress by the presenters, who asked whether stress was the trigger as a result of planning a wedding. Ellie was clear (thank goodness) that no, she wasn't stressed and that her mother-in-law had been great in helping to plan the wedding! She was clear she wasn't feeling stressed and that there was no evidence of it, but that she lost her hair nonetheless. You all know my feelings on the link between stress and alopecia, but in case you have missed it, this post and this one may put that comment in perspective. 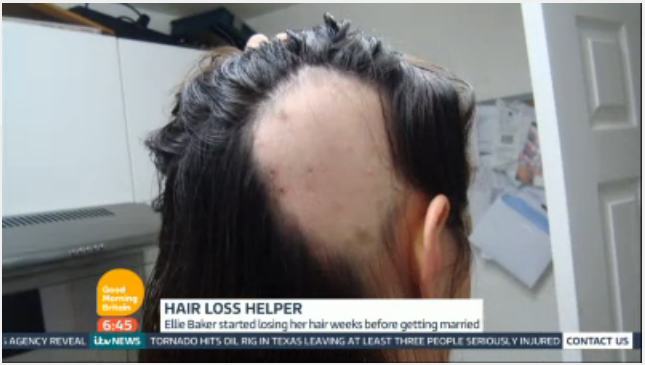 What I liked about Ellie is that she has turned her own, negative experiences into a positive one for others; she has spoken out on National Television to raise awareness of the condition and she has also set up a business helping provide replacement hair for cancer and alopecia patients! Well done her! Hair regrowth will vary from person to person; I've met people who have lost all their hair, then almost immediately received full regrowth which has lasted for months or years or to this day. Others who are in a perpetual cycle of shedding, growth, shedding, growth, shedding again. Then of course there are people just like me who have seen no more than a millimetre of growth or the odd longer hair, but never for very long! Anagen Phase: In simple terms, this is the 'growth' phase of the hair. Each individual hair grows for somewhere between three and five years, reaching lengths of up to 30 inches in most people. With good care, diet and a bit of luck, this phase can last up to seven years, reaching lengths of up to a metre! That's if you let it grow out of course! Catagen Phase: Occurring immediately at the end of the Anagen Phase, the Catagen phase is a transitional period for the hair, when the hair follicle begins to collapse. This indicates the start of the shedding period and can last up to 10 days. Telogen Phase: An immediate follow-on from the Catagen phase, Telogen is a period of 'rest' for the hair follicle, lasting around three to four months for each individual follicle. The hair follicle releases the hair shaft (the individual strand of hair), which is shed from the head and falls out. The hair follicle remains in this period of statis, before returning to the Anagen Phase to start growing again. At any one time, 90% of the hair on your head is in the Anagen Phase and you will lose approximately 80 hairs per day from the head. As each individual hair is at a different point in the cycle, it means that in normal cases, you won't see any thinning or baldness. When this cycle becomes interrupted however, it will cause baldness or patches of baldness, which may have many triggers. Looking at the hairloss cycle, it is clear that any regrowth is positive in as much as the hair is growing, but that is about all you can draw from it! Those experiencing hair regrowth should be happy, but also wary and honest with themselves that it may change just as quickly, taking each day as it comes, and those with no regrowth ever should not be disheartened that it will be this way forever, as it may change on a coin flip too (not literally). So yes, it's positive, but no it might not mean anything either! A couple of days ago, I shared a post on Pretty Bald Facebook linking to this article by Sarah Seward. In it, she describes her own experiences of hair loss and alopecia and the challenges she had coming to terms with it. "My hair continues to fall out in circular patches all over my head and starts to grow back on its own terms until it is ready to bid adieu again. My body is at a continuous war with itself. I repeatedly get sick, my lymph nodes in my armpits swell to the size of golf balls, I experience pain throughout my body and when my body inevitably surrenders, my hair soon departs. Alopecia is not only physical; it is a brutal, unrelenting mind game. I like to refer to those of us with Alopecia as warriors. We crawl out of our beds every morning to face the attacks our bodies will put us through and every single day we suffer the ignorance of our peers’ thoughtless and hurtful comments." I have to say, when I read this, I LOVED this analogy; but I loved it and relate to it in a different way to how Sarah seems to. Where she talks about the battle with our bodies and the courage and warrior-behaviour it requires us mentally and physically, I have another relationship; one that Sarah does allude to too. We are warriors because we are survivors; we are warriors because we challenge expectations and prevail. Sounds a bit cliché and possibly even a little twee I know, however for me, our battle extends beyond the everyday personal and individual challenges of our bodies to the wider ones too - the lack of awareness of alopecia, the lack of understanding, the lack of solid research, the feelings of isolation and loneliness - I could go on! It is this that makes us warriors, and you only have to look at the inspiring stories of other alopecians to see what an army we make! What I should add is that I don't see us as the only warriors - every person battling with something difficult is their own warrior and I won't diminish that. What we must ensure is that we remember we are worthy warriors too! More will follow on Sarah's post - thanks go to her; it was a good one! One of the best things about having no hair is that it has connected me with some amazing people. Along the way, I have been in touch with some useful and definitely interesting people, who have been helpful, informative or generally just interesting! One such lady is Mia, who manages the PR for The Vinci Hair Clinic, specialists in hair, eyebrow and body hair transplants, as well as Scalp Micropigmentation. Typically, most people will associate 'Micropigmentation' with the semi-permanent make-up that many of us opt for as a replacement to eyebrows. Not many will know that a very similar and highly effective version of the treatment also exists for the scalp - helping to disguise hairloss patterns and infill lost patches on the head, without the pain of hair transplant. I certainly didn't and I was really excited to hear about it! Just like Micropigmentation, Scalp Micropigmentation involves the application of pigment under the skin. In some cases, as well as camouflaging the area, it can also stimulate hair growth, although this isn't a certain side effect. It can be used to disguise thinning hair and bald patches in both men and women, to disguise scarring, to disguise the effect of all forms of alopecia and for restoring the patient's self confidence and yes, you did read that right, it can be used to help disguise alopecia, particularly alopecia areata. What percentage of the head can be covered using Scalp Micropigmentation? Although the pigment will naturally fade over time, this is a permanent solution and will last forever. Is it best to keep the rest of the hair short to make it effective? This is personal choice, but many men choose to wear their hair short with the illusion of a full shaved head of hair. Some women use it to change the colour of the scalp, disguising thinning areas of their hair, but still wearing the rest long. As promised, we'll be exploring this subject more, with two interview case studies (one of them is famous too) getting it straight from the horse's mouth so to speak! Moving on in our #100HairFreeDays and here's your next seven positive hair loss side effects! No more stepping on a hairbrush, which is almost as painful as stepping on a plug! 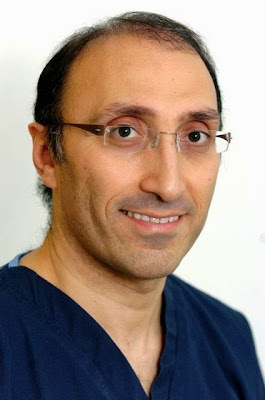 Blog by Dr Bessam Farjo, founder of the Farjo Hair Institute and medical director of the Institute of Trichologists. Every week, it seems a new ‘miracle’ cure for alopecia is hitting the headlines, but it’s important that those living with the condition know all the facts before starting a new treatment. Estimated to affect over 1.7 per cent of the UK population, new potential treatments for alopecia will always be a hot topic, but it’s my job to ensure that people exploring treatments are correctly informed and advised before any decisions are made. As many of you will know, alopecia areata is renowned for its sudden and random onset, whilst other forms, such as traction alopecia and female pattern hair loss, are more progressive. Treatment of alopecia areata can be controversial and, if you’re happy to live with your hair loss, my first piece of advice would be to leave it alone to see if it recovers on its own. Alopecia areata is a very unpredictable condition and there is always the potential that it will grow back without any treatment at all. If you’re keen to consider taking action, many doctors will advise you to start with steroid injections, as these are generally deemed the most effective form of treatment. These injections contain corticosteroids – an anti-inflammatory medicine which is essentially a man-made version of a hormone usually produced by the adrenal glands. As alopecia areata is a condition caused by the immune system ‘attacking’ its own hair follicles, the steroid injection works to suppress the immune system, so that hair follicles have the opportunity to grow back. These injections are usually administered to the affected area on a regular basis – but it differs from patient to patient. Another option available on prescription is oral corticosteroids, such as Prednisone. Again, these steroids work by suppressing the immune system to allow hair to grow. Many people will also be given the option of applying steroids topically, but the real long-term benefits of this are unproven. For those suffering from female pattern hair loss, there are an abundance of additional options available. Minoxidil – which is available to buy in lotion or foam (Regaine) – most likely works by regulating the potassium channels in cell membranes, and allows increased production of protein. This was proven by published research we collaborated on a few years ago, with University of Bradford. Low level laser treatment may also be something that people with female pattern hair loss would like to consider. Laser treatment works by projecting laser light energy directly on to the scalp to help strengthen the cells within hair follicles, thus promoting growth. Of course, hair transplant surgery is also an option for female pattern hair loss sufferers – although this needs to be carefully considered. Some women are more suited to surgical treatments that others, while some are not suitable candidates at all. There are a several different surgery options, including Follicular Unit Extraction (FUE), Follicular Unit Transplantation (FUT) and ARTAS Robot. The main difference between these procedures is that follicular units grafts are harvested in strips from the donor area for FUT – which are then microscopically dissected and prepared – whereas grafts are extracted individually in FUE. The ARTAS robotic procedure is a minimally invasive option that uses digital imaging and precision robotics to harvest healthy grafts for transplantation by the FUE method. There is no need for the surgical removal of a strip of tissue from the back and sides of the head, which means there’s no need for stitches or staples to close the wound. Benefits of FUE include a quick recovery time and the ability to return to normal activities soon after surgery, while FUT surgeries typically allow the transplantation of more hairs. Other people claim that platelet rich plasma therapy (PRP), Derma Roller and even Minodoxil are worthwhile treatments for alopecia areata. However, in my opinion, I think that the likelihood of results with these treatments is purely coincidental, as the hair more often than not comes and goes anyway. At the Farjo Hair Institute, we work hard to make sure our patients are armed with all the information they need to make the best decision for themselves, whether that is surgery, medicine or ‘watchful waiting’. So yesterday, I posted an update on Christoph Soeder's photography project "Faces Unfading" and as well as taking part myself, I also got the loveliest email from a lady called Sally, who also participated in the project! As a child growing up I had a love hate relationship with my hair. I loved that it was long and thick, I loved my mum brushing it until it shone or plaiting it overnight, so it fell in soft curls when undone in the morning; but I hated that it was so heavy it wouldn't stay curly or stay in a ponytail or bun. I hated that my nicknames were carrot or ginger because of its colour. In my teens the colour softened to a rich coppery gold; it became my crowning glory. In my 20s I abused it the way that all young women do, perms, colours, 80s weird haircuts. In my 30s I loved it again, styled in bouncy bob cuts that shone with natural highlights in the summer. In my 40s I started to lose it – just a small patch about the size of a 10p coin which grew back; then another, then a bigger patch. The doctor and hairdresser said not to worry, worrying makes it worse. For 15 years I spent a fortune on creams, shampoos and pills to make it grow – but nothing worked for long and when it did grow back it was pure white. So hair dye became my best friend. Life became a constant struggle to hide the bald bits. I felt at war with my hair. In my 50s my body hair started to go and I knew I was starting the slide into total hair loss. I felt my body had betrayed me, I felt like a freak. When I lost my pubic hair, I no longer felt like a woman. I was an alien, something not quite human. My self-confidence was shattered, but outside, to others I seemed strong and in control. I put a brave face on things, bought my first wig and fought back. Everyone said how strong I was, but inside I cried every day. Now my wig is my armour, my route to normality. Taking it off is now the challenge. I take small steps. First at home, then in front of my closest friends, next in the privacy of a beauty salon, wearing a head scarf to do yoga, a swimming cap at the beach, the first photo wearing a scarf, the first photo bare headed. Only one step left now – out in public. I know I will do it one day when I am ready. I plan to be with friends and other hairless women who will understand exactly what I feel. You might have spotted this post about the negative connotations of the word 'wig', but aside from their name, what about the decision to wear one? When losing my hair, I went through every stage of grieving; from anger to denial, grief to acceptance, switching back and forth between the different emotions for the full nine months it took to fall out. Without question, I wanted a wig - something to give me the opportunity to come to terms with it in my own time, without having to handle the emotions, questions or opinions of others. What's more, I wanted it to match as closely as possible to my natural hair, so that those who didn't know would barely notice the difference - potentially thinking I'd simply had my hair done. At the time, I don't think it was a concious decision, more a necessary one. As a novice, I didn't know a single thing about wigs - the options, the prices, the waiting times, but I did know I wanted one, and that I wanted one as fast as possible. I opted for a mixture of at-home research and seeking out an expert and whilst at the time I didn't have the confidence to buy online, it's something I wish I'd done. Still, that aside, for me, a wig was definitely the way forward and that decision came from me, not from any external pressures. Speaking to other people with alopecia, something that never ceases to surprise and amaze me is the differences in each individual journey and the different ways people handle the situation. Something that these differences confirm for me, is that there is no single 'right way' to handle your hair loss, but that being true to yourself is the single most important thing. During our trip to Alton Towers, I became engaged in a conversation about the decision behind opting to wear a wig. Whilst I, and many others struggle without the safety net and security of a wig (which isn't a bad thing), this person highlighted her own aversion to wearing them, right from the word go. This aversion, came simply from the fact that she couldn't handle or process the idea of wearing anything on her head, when her own hair was falling out - how could she handle the psychology of replacing her hair when her own was falling out? In case you haven't noticed, I am fascinated by alopecia and hair loss and also by the impacts both emotional and physical of what our bodies go through. I'm fascinated by the latest research, the ways we can manage the condition and so on... This conversation was absolutely no exception. Having only ever considered it from my own perspective and experience, going 'au natural' was a stage in the journey to acceptance - a positive step to helping me come to terms with my own hairloss. Naively, I thought each person was the same, particularly having met so many others for whom going out bald was a stage, that I never stopped to consider it the other way around. When I did though, whilst not part of my own process, I totally understand the choice not to opt for a wig in the first place and the way that can help you process! Once again, what this entirely confirms to me is that each individual person will and should handle this in their own way, and importantly should stay true to themselves on the journey! Wig or not, do what you want to do and don't ever let yourself feel pressured into believing that a wig is your only or mandatory option! I promise, even if you are now starting to get bored of us listing the positive side effects of hair loss, we're very nearly done! The end of week 11 means we've come up with 77 reasons why it's not so bad! Just 23 more reasons to go until we hit our #100HairFreeDays goal! Phew! No worrying about stupid hair trends like pixellated hair, or grey hair?! On the same note, no more embarrassing pictures of bad hair... Remember having curtains?! No money to spend on eyebrow waxes - ouch! No waiting for your hair to grow after a disaster haircut, wondering if it will ever be good enough to leave the house again! No bed head or post 'nap time' messy hair! No moment in the shower when you realise there just isn't enough shampoo in the bottle! A few days ago, I read a sentence from someone who said "wig" was a really scary word, and instead that she opted to refer to it as 'alternative hair'. Having never really thought about it before, this sentence really struck a cord with me and got me thinking about how I feel about the word "wig". Wig is not a word that has ever really bothered me; it is what it is and my wigs are just that - wigs. When I first needed one, it's what I looked for online when I searched "buy wigs" and "wig specialist", it was what I refer to when I blog, talk or sell; in fact, it's what everyone else I know refers to them as too. Sometimes, I will use the phrase alternative hair, and indeed some of the wig brands I wear also refer to them as such, but I've never really thought twice about "wig" before. Now that I have been triggered to think about it, the first thing I did was Google what the word 'wig' means; according to good old Google, it is defined as: "A covering for the head made of real or artificial hair, typically worn by judges and barristers in law courts or by people trying to conceal their baldness". Not what I was expecting at all - for it to be defined by its' use and not what it is. For me personally, I would define a wig as 'an alternative to natural hair, made of knotted human hair or synthetic fibres', potentially adding 'used to create the appearance of natural hair'. The use in the given definition of the word 'conceal' doesn't sit well with me, given the use of wigs and weaves to create more manageable hair, their part in disguises and fancy dress, and of course, their use by judges and barristers, but I understand the sentiment. That definition aside however, I personally still don't get a negative feeling about the word 'wig', although I appreciate why others might. Having only lost my hair a few years ago, I have had the perks of the latest wig technology and the ones available now, whether synthetic or human hair, are exemplary giving natural hair a run for their money and providing every user with a comfortable, natural experience. In fact, whatever your wig-based preferences, there is an available and viable option for each individual need, if you want it. Roll back a decade or two however and natural-looking wigs were the privilege of the rich and famous like good old Dolly Parton. For everyone else, itchy, scratchy and thick wigs that looked stiff and were not far from the hairstyle of a lego person were far more the norm, and they didn't come cheap either. I guess for many therefore, those whose hair loss has been around far longer than mine, wig may be a more negative word, but then again, maybe not. Looking at it a different way, if you don't call it 'wig', what else do you call it? Returning to Google and typing in 'wig synonym', it suggests Postiche, Toupee, Rug, Hair Extension, False Hair and Weave, but no viable alternative which encompasses the whole collective. Yes, alternative hair does encompass them all, but it doesn't exactly trip off the tongue. Hmmm! I'm still not convinced on the negativity of the word, but that is of course entirely my personal opinion. I guess for me, I'm not sure where the negative connotations come from, but I don't deny they exist for some people. For me, any potential negativity comes not from the word, but from certain realities, like my own terrible first wig, but the word will never put me off my love of them! How about you guys? How do you feel about the word? Or about wigs for that matter? Don't forget to let us know! So this month's model is Emma, who would describe herself as a loving mum and successful businesswoman. 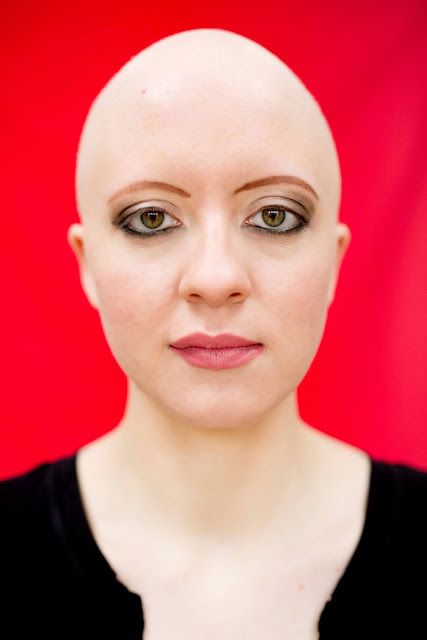 She is 31 now and her alopecia began at the age of just 12 with a traumatic family experience. Whether it was the stress, or the physical state of her body, she lost her hair in just a few short months; not long after, her eyebrows, eyelashes and body hair followed suit. Emma is clear that although she is happy in her skin now, it's taken a long time for her to come to terms with the condition and her journey included bouts of depression and anxiety, alongside an eating disorder. She's an incredibly strong lady and a lovely person! The calendar wasn't her favourite thing to do, but she triumphed and I think her image is lovely! At this stage, no regrowth has occurred, with the exception of a single hair on her head which has reached the grand length of five inches! So, this week marks the end of our tenth week posting #100HairFreeDays and that means that's 70 reasons why hairloss isn't so bad! We're on the homeward straight now and hopefully we'll make it to the full 100! It is getting harder now though! Built in disguise or very easy to switch for fancy dress! Hair stuck in jewellery clasp stuck in hair! #Tangled! So I have been away for some time and I must apolgies for that. I have had such a busy month or so , moving in with my boyfriend ,kieran, whos across the country to me and then moving jobs and finding a new one. Basically im growing up ! But I'm ready for it. I also wanted to spend some time away to try and find myself . Without this sounding incredibly dramatic of course . I was always known as 'danielle with the curly fire hair' ( having red and yellow hair of course ) for many years , but when my hair fell out .... well you can feel my pain. We have all been through it or know someone who has. So over the month away I thought I was coming to grips with my hair loss. My partner kieran couldn't of been anymore supportive if he tried . Hell , I even got to the point I was cracking bald jokes and even making myself laugh. Many people asked why i wore hats ,id turn round and say 'because im BALD' i must admit i loved seeing there faces ..... so awkward !! Everyone I worked with new about it and no one cared . I even have a nice thin layer of white hair on my head . Everything started to look positive ! 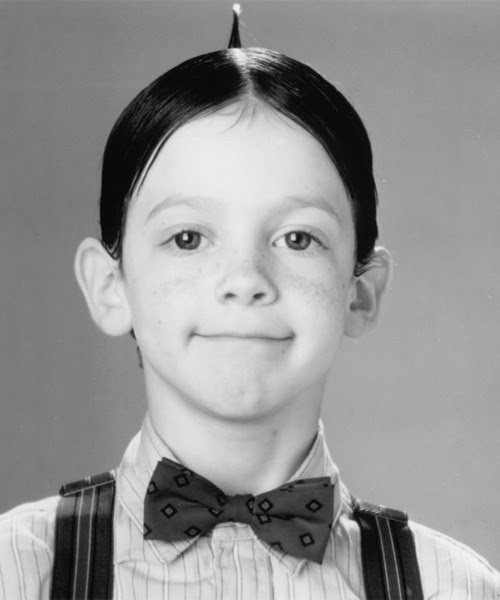 It then got to the point were I looked in the mirror one morning and saw a patch of hair missing from my eyebrows . Every positive thought I had was just gone ... I felt so deflated and like I was back at square one . I worked so hard to get over my hairloss, and now I had to watch my face being rubbed out. Its devistating. What's worse is that I'm more concerned about my partner. He tells me he loves me and that I'm beautiful everyday . However when I wake up and look in the mirror all I see is a blank canvas . How can you love that ? How is this beautiful ? I don't feel it and being someone who's not flush in money I can't even afford to get my eyebrows tattooed on. I'm guessing my next hurdle is to over come this. I do have alot of thanks to give to the ladies on twitter and pretty bald . I think without your support and encourageing words . I'd be alot worse of than I am , mentally . Our alopecia community is the best support group for me and I do love you all ! Everyone has an opinion on things and whether you are looking for one or not, people are often over-zealous in expressing them! From advice about getting through 'my chemotherapy', to the necessary adjustments to my diet and obvious malnutrition, I've heard it all, and more often than not, they have come from strangers. Strangers who don't know about or understand alopecia, let alone understand the emotional or physical implications of the condition. For me, one of the best opportunities I have been given is to share my experiences with others and have them share theirs with me; Alopecia UK in particular has been instrumental in this, establishing support events that put me in touch with other alopecians, but so too have people who know about my hair loss and have pointed other alopecians and cancer patients in my direction for a chat. Alton Towers earlier this year was one such event and if you are looking for support, I suggest you head in their direction. About six weeks before the hair on my head finished shedding, I remember this feeling of helplessness. There was a six inch patch of hair remaining on the crown of my head, a few wisps around my nape and two fringe pieces that ensured I looked remarkably like a monk who'd made the faux pas of opting for curtains! Not my best look, but one that I was nonetheless sticking to! I was sat on the floor with my legs crossed and my mum was tenderly teasing the matted mess on the top of my head, seeking to ease out the tangles and return it once again to a semblance of my shiny natural hair. She'd been doing this for weeks as the hair got less and less and the matting got worse and worse but I needed it (thanks mum)! That particular day, I was at rock bottom and an anxious feeling had settled at the bottom of my stomach like someone had grabbed it with an ice cold hand. I felt trapped. No other word for it, trapped. Trapped I think by my own emotional attachment to my hair, by the uncertainty of what I faced, by the ridiculousness of the situation I found myself in. I started to feel claustrophobic and with little warning, I pushed myself to my feet, choking back sobs as I sought a way to be free of this prison. I stumbled my way up the corridor and grabbed a pair of scissors, racing back to my mum as she ventured towards me looking helpless. "Get it off." I said "Get it off, now!" Mum guided me to a chair and I remember the look of trepidation on her face. Was cutting it off the right thing to do, or would she be helping me take an action I'd ultimately regret? I continued to whisper "get it off" and mum gingerly picked up the offending locks of hair. A quick snip and she was through - gripping what was once my crowning glory and was now little more than my tormentor and betrayer. Within moments I felt better! I was free! For months, I'd watched as my hair seeped from my head and now, I was back in the driving seat, back in control. After that point, I don't really remember very much; I remember heady waves of relief, anger at not doing something sooner, confidence as I felt a little of my old self eke back in and most of all gratitude. Gratitude to my mum for wielding the scissors, gratitude to my family who were there no matter what, and gratitude to my boyfriend for loving me in spite of it all! I can't really narrate the following few days - they're a bit of a blur as the stubble continued to shed, but I slowly felt like I was finding my feet again. Those days and weeks were so much better than what had gone before! True, the hair was still shedding, but instead of clumps of visible hair remaining on my pillow or washing down the drain, they were replaced by tiny bits of stubble barely there to be seen or remind me. I cannot and will not presume to tell someone else how they should or should not cope with their hair loss, but when someone asks me if I regret anything about my alopecia, it is always my lack of confidence to take control back sooner. Sure, it doesn't change the fact it's happening, or make it any different physically, but it made a whole heap of difference emotionally as I felt back in charge! One thing I should of course probably add is that there will be a tipping point in everyone's journey; there is no way I'd have had the courage or even need to shave my head early on in my journey, so if someone had said 'shave your head' I easily could have ignored it, however in hindsight, I simply wish I'd had the courage to do it a month or two before I did. To anyone who is supporting someone going through the same, it isn't easy, but remember, sometimes the hardest suggestions to make are the ones most needed, and at the end of it all, be there as a hand to hold, no matter what! This post is about donating your hair to charity and has kindly be written by my work colleague Kirsten - enjoy! About a month ago after a night out, my friend Emily decided that she wanted to cut her hair off after she woke up with it smelling of smoke and in such a knot that it took her a good ten minutes to brush out. She decided that if she had to get it cut off then she at least would do something wise with it. The Little Princess Trust is a children’s cancer charity that specialises in supplying real hair wigs to children suffering with cancer for the duration of their treatment. They also assist children with other conditions which result in hairloss; the most common being Alopecia. Their hope is that the gesture will help the child and family, whilst they decide on long-term plans for dealing with this condition. Well done Emily; I'm just going to leave the link to Emily’s Just Giving page, just in case. In the meantime, you can get in touch with The Little Princess Trust to see about donating your hair. A little while ago, I wrote about people having a #WigWorry, but haven't had time to write one since! It's time for another one though and this one is inspired by the weather outside! I'm not sure about everyone else, but right now, in my area there's some gale force winds roaring around, and despite not being as cold, they're giving the mid-winter gales a run for their money! Talk about windy! Well, one of the things many people worry about when wearing a wig is that it'll blow off and they'll be left exposed, feeling more than a bit nippy! So how can you prevent it whipping off? Buy a wig that fits... I know 'a wig that fits' sounds really stupid, but you'll be surprised how many people opt for the first wig they can find in desperate moments, or haven't got the experience to pick the right type of wig for them. When buying a wig, measure your head (I'll write a separate post on that), then ensure that the wig you are picking matches as closely as possible to your own measurements. If you can't find a close match, don't panic; I for one have 'abnormal' head measurements, with a large crown, small nape and medium circumference which makes buying an off-the-shelf wig more difficult. There's a solution for every head type though, so for me I opt for wigs with adjustable sections at the nape, enabling me to fit the wig to my head, but at the same time leaving room for the crown. I'll write a post on cap types too, but for the purposes of keeping this post simple, I'll simply advise you to pick the wig that fits. For some, it'll be an adjustable one, some will opt for silicone grippers and some will go for PVC they can glue. Properly adjust it... Whatever wig you opt for, ensure that it is properly adjusted on your head for both maximum comfort and security. If it's too shallow or not properly fitting, there will be areas that are more susceptible to gaping or springing off. If your wig is properly adjusted, it should feel comfortable, without giving you a headache and will withstand a gentle tug backwards. Obviously it isn't attached, so it will come off with a hard yank, but gently lifting should confirm an element of security. Opt for added security... Personally, I don't need it, or particularly like it, but added security can be created through the use of adhesive tapes or glue. A few small sections will be just enough and no amount of wind will take it off. You can also add a beanie hat (because if it is windy, it's likely to be cold too), a hairband, or add a wig cap or grip band underneath the wig to ensure that it has additional friction. Wind can be a bit of a pest to wig wearers and there will be times when it feels a little like it is lifting in the wind, but as yet, I haven't managed to lose mine on a windy day. To prove it, here is a YouTube video of the gale force winds blowing earlier in the week, and a make-up free, very grumpy faced video of me in my wig! Sorry I don't look a bit more enthusiastic, I was focussing on not being blown over! In 2013 Jessie J decided to shave her entire head of hair for Comic Relief, and she rocked the look for around about three months before she decided to grow it back. She told Glamour Magazine, “There’s no point in shaving your head for charity if you’re going to grow it back the next day”. She also said that she had to shave her head at least three times a week because it kept growing back. Jessie J donated her hair to support The Little Princess Trust. Although hers isn’t an overly well-known name, a lot of people will recognise her as playing Kate, a cancer-ridden teenager in 'My Sisters Keeper'. Vassilieva decided to shave her whole head for the film, and had her hair made into a wig that she donated to a charity called “Locks of Love”. Whilst you definitely won't peg her as a baldy, a few years ago Victoria Beckham’s hair started thinning just after she had her little girl, Harper. She attempted to keep her hair from falling out further by stocking up on various hair loss remedies and supplements but at the time, nothing worked apparently. 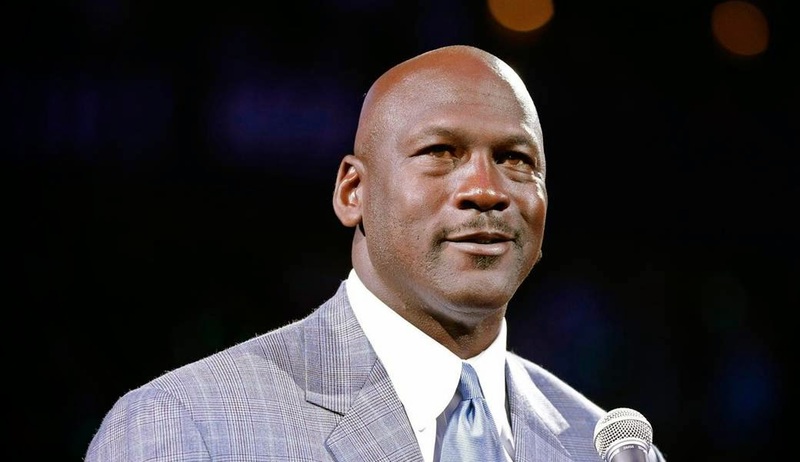 As soon as Michael Jordan started thinning on top, he made the decision to shave. Jordan was so confident in his look that he started claiming that he was the reason why shaving your head became trendy in the first place. Shaving your head is now perceived as one of the best ways of dealing with male baldness. 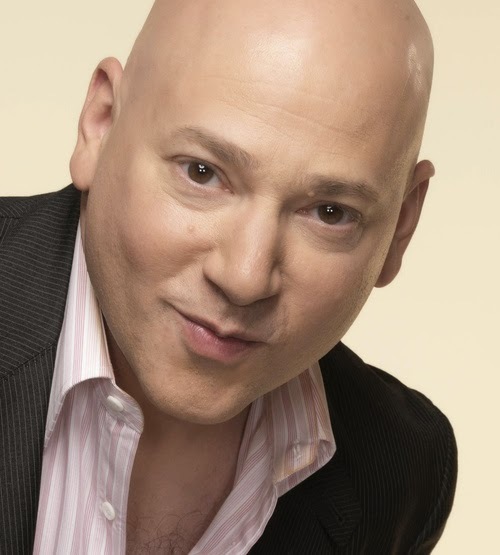 Evan Handler lost his hair after a battle with leukaemia when he was 24. There is usually a high chance that hair will grow back after treatment however Handler’s didn’t. He commented saying “I hoped my hair would grow back for a long time, but when it became clear that it would not, I shaved off whatever grew there. I am now known for the way that I look.” He also said that when you’re fighting for your life, you come out of it realising that hairloss isn’t the end of the world. So there you have it, my top five male and female celebrity baldness stories! So, back to the question in hand; what makes a good wig consultation? Expertise - One of the key things you expect from someone who's helping you to find a wig is expertise, but surprisingly not every wig consultant is an expert. There is a big difference between someone who has a wholesale account and can order wigs, and someone who actually has the expertise to help you. As you will see from this post about my first experiences, that difference can be huge for you emotionally. Before you even get to the stage of going to see them, you should chat, email, skype, tweet or somehow get in touch and see if they clearly know their stuff. There are a lot of well-meaning people who get involved in wig sales to 'help out', but the risk is a well-meaning novice will create more problems than they solve. A good range / choice - The number of wigs they have actually in the shop doesn't matter, but the range that they carry do! Many businesses understandably cannot afford to carry a lot of stock (it quickly gets expensive), but they should have a few different sample pieces helping you to get an idea of cap types, fibre types and difference in quality and should also carry a range of different brands and collections. This is really important because one thing I have found out along the way is that just because someone LOVES a range of wigs themselves, doesn't mean it will be suitable for you, your budget, your lifestyle or even what you are comfy with. As part of the expertise point above, they should be finding a wig to suit you, not the other way around! Head Measurements - They should take head measurements before ordering a wig; every wig will come with dimensions etc, and whilst some are adjustable, it is important to make sure they are near your size. I have had a wig arrive that I could spin on my head, simply because measurements hadn't been taken! Communication - In the majority of cases (unless you are having a specialist wig made), wigs will arrive in around 1-2 weeks. However, sometimes they could be on back-order due to a sudden rush on a particular style or problems with the manufacturing, so communication is key! Find someone who promises to keep you up to date and more importantly actually does, because trust me, there is absolutely nothing worse than waiting weeks for the phone to ring with an update, or feeling like a pain as you ring and ring and ring. Charges - You'll have to make up your own mind on whether or not you are happy to pay for a consultation. However, some will charge you, some will charge you a fee redeemable against the price of a wig and some will offer their time for free. Ultimately, this is your choice, but don't be surprised if you do need to cover the time costs that someone is investing in helping you! Education - A good consultant will share some of their expertise with you, to help you make the most of your wigs. From hair washing to styling, removal of glue (if you use it), to storage, you should leave with everything you need to know to keep your wig looking lush! 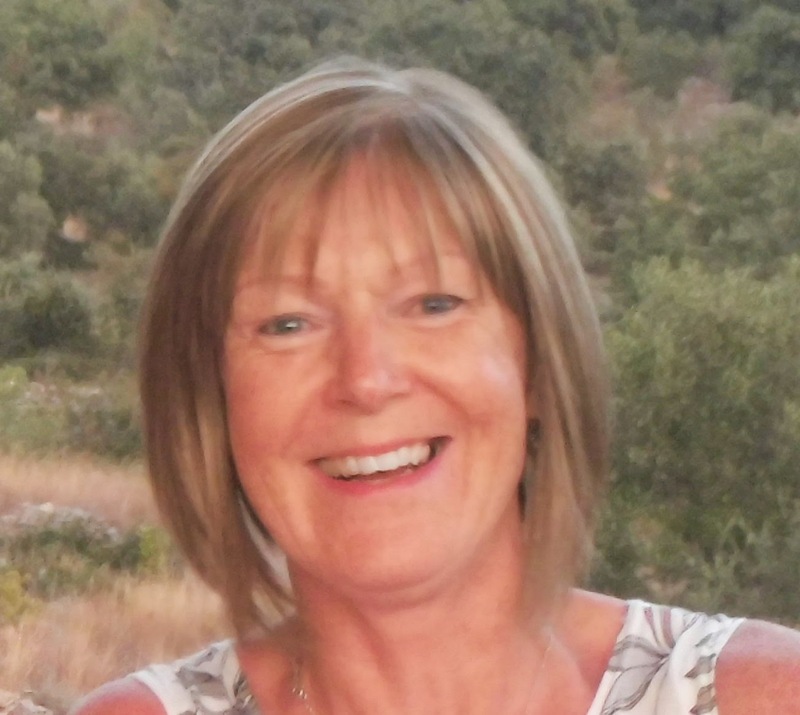 Added bonus - personal experience - It is a little harsh to expect a wig consultant to have first-hand experience of wearing wigs, however if you do stumble across someone with hairloss who also sells wigs, you're probably on to a winner! They can give you a first-hand insight, speak from experience and offer a valuable insight about different wigs that you simply won't get anywhere else! Ultimately, you should leave feeling happy and comfortable; hair loss or hair thinning can be traumatic, but a wig consultation should reduce that stress not add to it! Alopecia UK do offer a suppliers' directory for you to search, but make sure you feel comfortable with them before you take the plunge! "That night, instead of a blowout, my wig got destroyed. The hairdresser washed my hair wrong — you can't scrunch up hair on a wig the way you can natural hair — and it ended up in a gigantic knot. All the leave-in conditioner in the world and hours with a comb couldn't help him detangle it." This sentence made me feel more than a little sick! Not only is a wig ruined and the poor girl has to venture out in the cold with no hair, but there was a $4,000 price tag AND to make it worse the guy apparently knew about wigs! True, accidents happen, but this story does highlight the need for you to a) understand your own wig care so that you can stop others being stupid and b) select someone that is actually qualified, not a well-wisher. Unfortunately, a lot of (not all) hairdressers start selling wigs to help out clients with cancer or alopecia or similar, without a real understanding of their individual needs. The best way to blow dry a wig is first to wet it with a spray bottle as it allows so much more control! At home, at least you are in charge and can be more assertive, but in a hairdresser, sometimes fully wetting is best avoided! "The new wig was good enough, but it wasn't great. It still didn't fit right. It looked like a wig, which didn't make up for the $4,000 price tag or the emotional cost." Don't accept second best! It's clear from this story that the poor girl had no choice, what with a holiday the next day, but it's your money so YOU have to be happy! A couple of times in my life when I had my own hair, I left a salon thinking the haircut wasn't quite 'me', but also knowing that with a wash and natural bounce it would probably look better, and if all else failed it would grow. A wig won't, so make sure you are happy with it, before you leave the shop or take out the label! "Not everyone has been scared that a strong gust of wind could unseat her hair." This makes me so sad and isn't something anyone should feel! I can categorically say that the one and only time I have lost a wig is chasing my dog under a tree and hooking it on a branch. Occasionally, sections of a wig can lift in extreme wind, but even when we've had gale force winds it has coped! This is simply because of the fit - whether synthetic with an adjustable cap or human hair with silicone sections, if it fits, it's pretty difficult for the wig to come off! If it's really that windy, then it's probably cold too, so a beanie hat is great for added security if you are that worried! "Not thinking about my hair all the time has given me back the confidence I didn't realize I was missing — when I look in the mirror, I feel good about the person looking back at me. I've been worrying constantly about my appearance since I first watched my hair slide down the drain in clumps every time I took a shower all those years ago. For the first time in a long time, I feel like me." Just because you wear a wig, you shouldn't have to think about your hair all the time and certainly I don't! If you are, then either you haven't found the right wig yet, or honestly and truly wigs are not for you! A wig should be like a fab pair of shoes - something that makes you feel great, not something that you wish everyday was different! You may or may not have spotted me share this story on Twitter and Facebook yesterday, about one girl's wig experiences and the emotional and financial drain she faces. When I posted the story, I also promised to blog about it and give my thoughts (I have very mixed feelings about the piece) and it has inspired a series of blog posts, of which this is the first! The first thing I did was watch the video, and I went from horrified to pretty angry at the content of that video! The video is inane and very misleading and whilst I appreciate the hair stylist is responsible for Beyonce's beautiful, bouncy locks, if my wig consultations went anything like that, I'd have been out the door faster than you could say 'wig'. There are two common ways to buy wigs; first, through a wig reseller, either a hairdresser or wig specialist or second through an online store. What that SHOULD involve is an opportunity to discuss and consider your options, likes and dislikes, and second, the opportunity to see what a wig looks like before saying 'this is the one'. Upon watching the video (which takes a different tack), the hairstylist tells the girl what she will have which 'should come in at less than four grand', and then when they are ordered in and arrive, the pair decide 'this is the wig' after no more than wafting it around on a polystyrene head. Luckily for her at the end of video, she walks out with glamourous, very natural looking hair and a big grin on her face, but no thanks to the consultation in my eyes! I hope to goodness that this is just a poorly edited, low-budget video to 'add interest' rather than a glimpse at the reality of the consultation; but based on my discussions with other people, this type of experience is all too common! Don't ever believe that just because someone sells wigs for a living they a) have a clue what they are talking about, b) understand the emotional and physical experiences involved in wearing a wig or c) resell the right wigs for you. There are a lot of absolutely fantastic wig specialists and advisers out there, but there are also many that 'fall' into selling wigs, either as a way to make money, as an extension to a hairdressing business, or because they originally tried to help out a friend. Unfortunately, the latter can often leave people with a feeling that wigs are essential but a nightmare, rather than the much more desirable accessory that fits simply and easily into your everyday life. What a good wig should make you feel is fabulous and your natural self, and in the best case scenario should make you fall in love with it! True, it isn't your natural hair, but when you can't face the prospect of being a #BaldHeadedBeauty just yet, you wig should be your absolute best friend, not an item to be tolerated. There are probably a million different wigs on this planet ranging from synthetic to human hair with different cap constructions, styles and prices. For a good wig that's suitable for medical hairloss rather than dressing-up, you should expect to pay somewhere between £100 and £4,000 depending on your choices. £4,000 should not be your starting point and should be a very serious, considered decision as there are plenty of lower-budget wigs out there that can be just as good as a £4,000 one; trust me! TRY. IT. ON. I cannot stress this enough - try a wig on. How good they look and feel will depend on your head shape and size, the cap construction, the colour of the hair, the colour of your skin and the shape of your face. Something that looks fabulous on a friend can look entirely different on me, and just like buying a dress, you have to make sure it fits when it's actually on. True, your consultant can help increase the likelihood that it will fit, but they can't guarantee you will like it until it is on. Even if you order it online, as long as you don't wear it for hours and send it back with any obvious wear, you can give it a try to ensure you are happy! Think about your lifestyle; a wig is not a direct replacement for your hair, because it is not growing out of your head! I know that sounds a tab obvious, however it does mean that it isn't repairing itself or growing, and therefore it will deteriorate over time. I have both human and synthetic wigs, but having an active lifestyle with a lot of dog walking, windy days and not a lot of spare time, it's my synthetics that get the most wear, offer the best value for money and suit me the most. Don't think that a synthetic can't be as good as real hair and make a considered choice rather than selecting the closest physical match to your original. As I said, this seems to be just a poorly shot promotional video rather than any serious reflection on the appointment or service offered (she expands on the service in the actual article), but it does unfortunately provide unrealistic expectations and your wig experience just shouldn't be that way! If you do have any questions, feel free to email me and I'll be happy to point you in the right direction!